I went off of a recipe I found on Iowa Girl Eats, one of my absolute favorite blogs. This girl is just so cute and cheery and posts recipes that are so simple but super tasty. Plus, she’s also a MWG so bonus points for that. Slice beef into thin bite-sized pieces and then toss in a bag or bowl with some cornstarch. Coat the beef in the cornstarch, shake off the excess, and set aside. Heat up a large skillet or wok and toss in some vegetable oil and get it nice and hot. 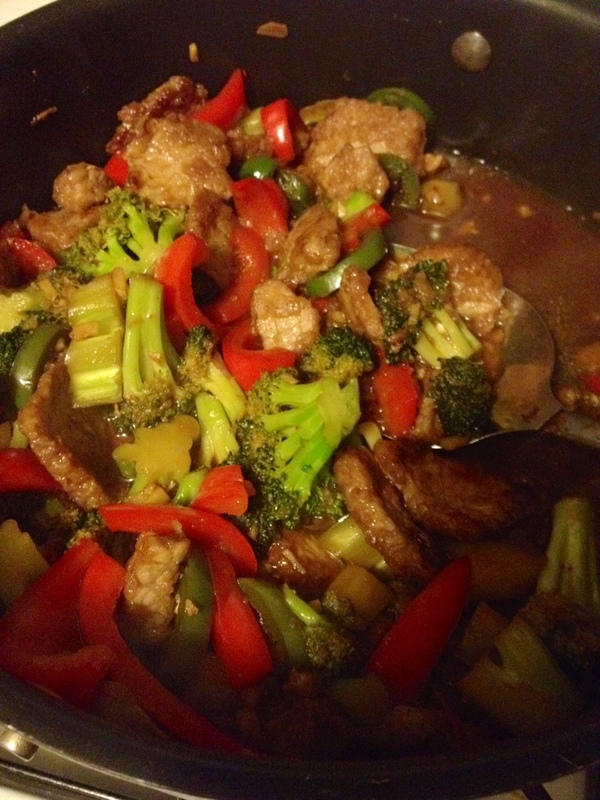 Toss in the jalapeno pepper, red bell pepper, and broccoli and let that cook for a couple minutes. Stir it around with a wooden spoon occasionally. Tip: I’ve noticed that Americans never use the broccoli stalk. I’m not sure why because it’s delicious and it seems like a big waste of food. If you’re not used to cooking the stalk, just peel the tough skin with a vegetable peeler, cut it up, and throw it in your stir fry. Delicious. Throw in the garlic and ginger and mix that around. Then immediately put in the brown sugar, water, and soy sauce. Turn down the heat to medium and let that simmer for a couple minutes. While the sauce is simmering, in a separate pan heat up some vegetable oil and add the beef until cooked to your liking. Add more red pepper powder or flakes if you want it real spicy. Add beef to the sauce and turn down the heat until the sauce thickens up. Tip: If you want thicker sauce, add some cornstarch to warm water and stir that up. Slowly add a little bit of the mixture in at a time and stir the sauce until you get your desired thickness. Serve over a bowl of hot white rice. I really liked this dish. And judging by R’s second big bowl, he liked it too. It was spicy, saucy, and packed with flavor. It was also super easy. The original recipe calls this “Mongolian beef”, but I’m not really sure what’s so Mongolian about it. I think the sugar, soy, ginger, garlic combination reminds me of Korean flavors, but the technique and type of dish is Chinese. I guess I’m admitting that I don’t really know what Mongolian food is like. 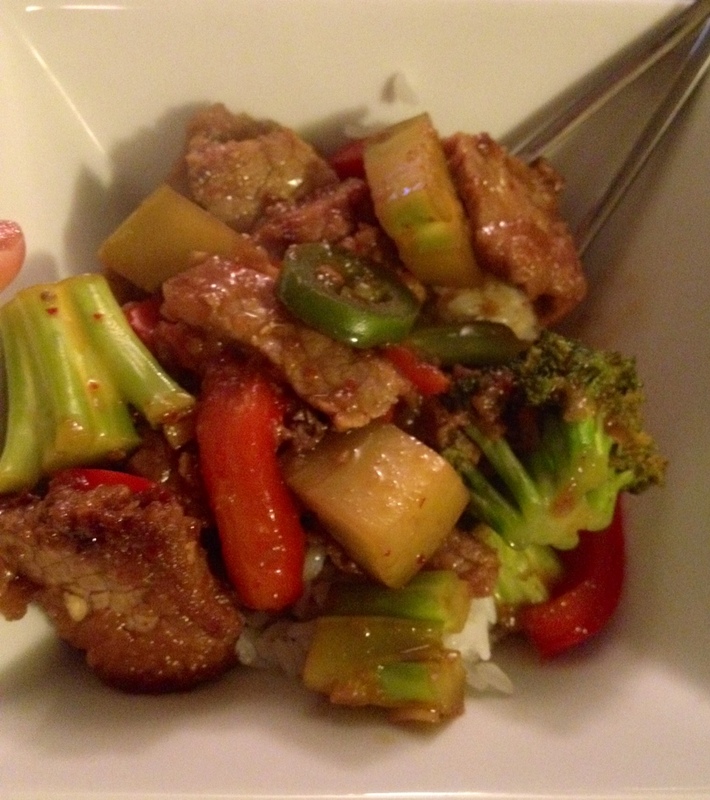 Anyway, because of my ignorance I’m just calling this spicy beef stir-fry.